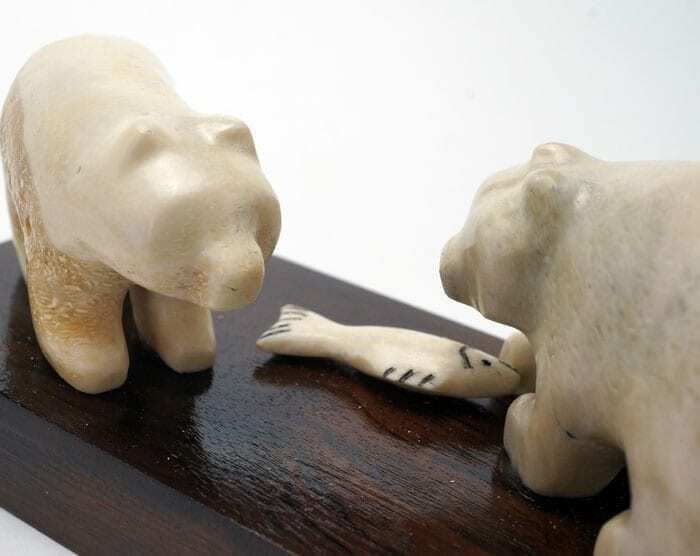 David Farnham is a carver of the Onandaga tribe, one of the Iroquois Six Nations in Canada. 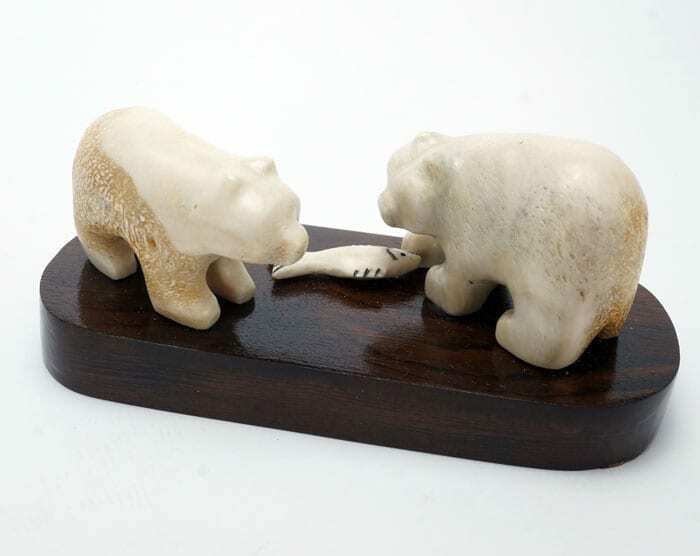 The two bears are carved from an unusual material: bison bone. The porous part of the bone invites a nice contrast with the more solid, polished part, both in terms of texture and color. All and all, it is a wonderful composition. 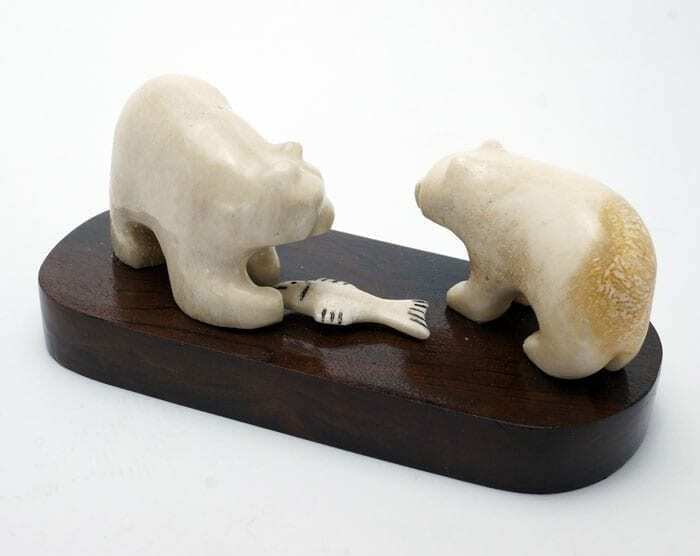 The fish is carved from antler. All are mounted on a wood base. Base is 5 in. long x 2 1/8 in. wide x 9/16 high. 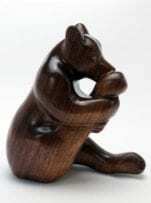 Bear 1 is 2 1/4 in. long x 1 1/4 in. high x 7/8 in. wide; bear 2 is 2 1/4 in. long x 1 1/2 in. high x 1 in. high. Carved from limestone, this sculpture embodies grace. 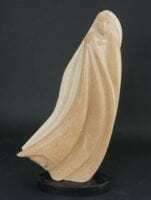 From the texture of the stone to the long, flowing hair, this sculpture is wonderfully evocative. Mr. Fragua is an acclaimed sculptor who was commissioned to create a monumental statue of Pope, the 17th century Pueblo rebellion leader. The statue stands in the Hall of Governors in Albuquerque. 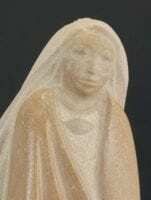 19" x 10 1/2" x 2 1/4"
David Farnham Transformation David Farnham is a stone carver of the Onandaga tribe, one of the Iroquois Six Nations in Canada . He uses Brazilian soapstone for its color and textural qualities. This carving represents a human/bear transformation, likely a shaman creating wind. 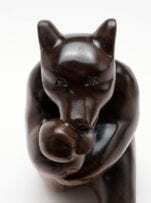 The colors in the soapstone, combined with the skillful carving, create a wonderful sculpture for anyone's collection. 6 in. long x 3 1/2 in. high x 3 in. wide.